Figure 5.13. 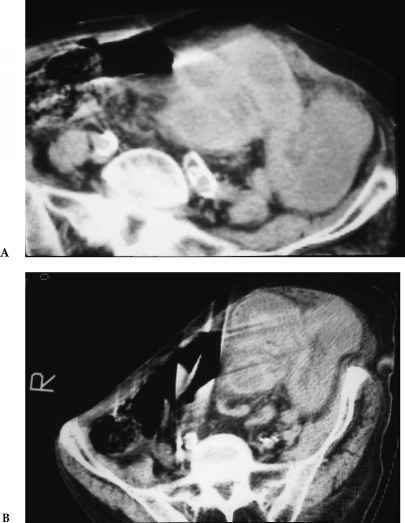 Small-bowel obstruction with adhesions and ischemic stricture. (A) Supine plain film of the abdomen shows multiple dilated small-bowel loops having the same diameter as the colon, diagnostic of an incomplete small-bowel obstruction. 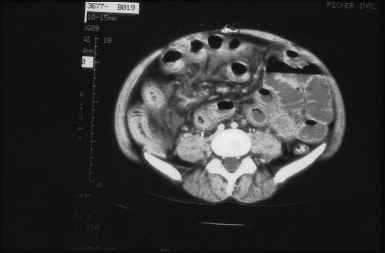 (B) CT scan shows a relatively collapsed loop of small bowel just distal to the dilated small bowel (both without significant oral contrast). 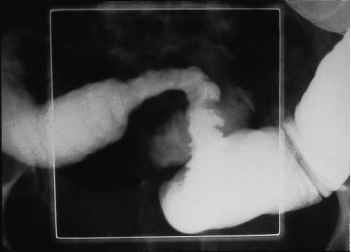 (C) Spot film from a single-contrast small-bowel enema demonstrates acute angulation consistent with adhesions. In addition, the angulated loop is stric-tured by ischemic changes. detect the presence of a closed-loop obstruction, and last, but certainly not least, to detect the complications of a closed-loop obstruction, strangulation, and ultimately intestinal ischemia and necrosis. In the evaluation of the subset of small-bowel obstruction caused by adhesions, CT imaging can reach a sensitivity of 100% and a specificity of 90% . Most often, the lesions themselves are not seen, and the diagnosis of adhesive small-bowel obstruction is one of exclusion. Another study of patients with suspected small-bowel obstruction showed that CT made the correct diagnosis of small-bowel obstruction in 34 of 43 patients with similar accuracy for the level and cause of the obstruction . scanning the patient in supine and either prone or decubitus positions (Fig. 5.16). scan through the pelvis shows three loops of mildly dilated small-bowel with a thickened small-bowel wall with increased attenuation. The prominent mesenteric vascularity of the middle loop is the result of arterial inflow, but no venous outflow, in a closed-loop obstruction. Figure 5.18. Small-bowel obstruction with ischemic changes. CT scan reveals evidence of mesenteric ischemia with hazy mesentery and interloop fluid. The loops of small bowel show varying degrees of the "halo" sign as well as differing amounts of contrast enhancement. Figure 5.19. Small-bowel obstruction with bowel ischemia. 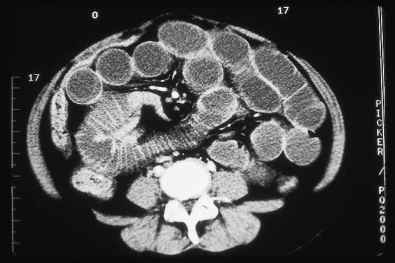 CT scan of the midabdomen shows a loop of small bowel with a very thickened, edematous wall and a narrow lumen. Considerable edema is noted in the adjacent omentum. Figure 5.20. Small-bowel obstruction with bowel necrosis. 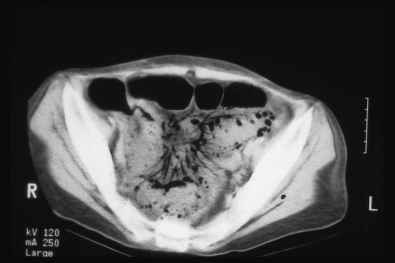 CT scan of the abdomen demonstrates a loop of dilated small bowel in the midabdomen with pneumatosis. Directly posterior to this loop is air in the splenic vein (just anterior to the superior mesenteric artery). small-bowel wall (again not defined), pneumatosis intestinalis (Figs. 5.20-5.22), and portal (Fig. 5.23) and/or mesenteric venous gas  (Fig. 5.21). Figure 5.21. 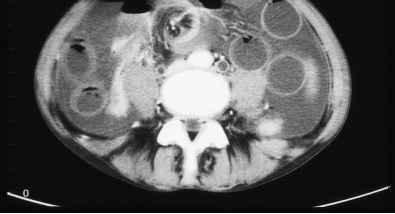 Small-bowel obstruction with bowel necrosis. CT scan through the pelvis reveals multiple loops of dilated small bowel. Innumerable linear collections of air are seen from gas within mesenteric veins. Severe pneumato-sis is also seen. 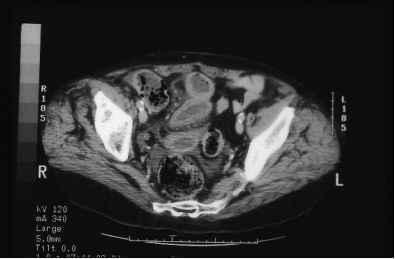 What is collapsed loop ct scan result? What is a collapsed bowel? What is the meaning of small bowel loops are collapased? What is the treatment for collapsed of small bowel loops? What causes the small bowel to collapse? 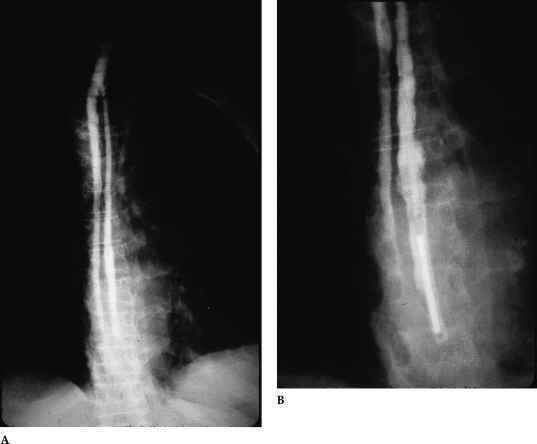 Can distal small bowel loop that collased self repair?